Dawn McTeigue is a comic book cover & interior artist. She is the lead artist for JP Roth’s Southern Nightgown, JP Roth & Bluerainbow Online’s REM:8. 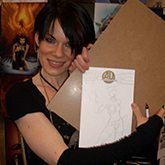 She has also worked as a cover artist for Rothic Novel collections, Aspen Comics, Lady Death, Bluerainbow Online, Big Dog Ink & Zenescope. Dawn lives in Calgary, Canada with her husband & 3 kids.